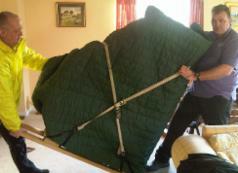 As the leading Essex & Suffolk removal company, We offer a full range of house removals services. Whether you are moving home, moving within Ipswich or within the same town, moving overseas, moving yourself and only need some boxes or you need an Ipswich removals company who can move a couple of items. We have the expertise, a large fleet of removals vehicles and quality, experienced staff to complete any Ipswich removals or delivery task with ease. We are proud to have the VERY BEST and most experienced: Managers, Surveyors, Telephonists, Supervisors, Drivers, Removals porters and modern removals vehicles. Over the years we have never encountered a removal dilemma that we couldn't resolve and our accumulated experience stands us in good stead for every removal task we undertake. We are committed to caring for our customers and their precious, hard earned furnishings & possessions. Each of our vans has an appointed team leader who is responsible for ensuring every move we undertake is completed in the most professional, careful and cost effective manner. We offer a simple, honest & totally reliable service. We have over years, gained a respect and reputation second to none. Call us today 8am-8pm on Ipswich 01473 396365 FOR A GREAT QUOTE. No matter how large the move. We have the vehicles and manpower to move 10,000 cft of goods. No hard sell, commission paid, removals company salesmen or surveyors calling and talking you into booking an overpriced service. Store delivery & collections, Ebay auction collections, specialist piano moving, antique and valuables, packing services, boxes and bubble-wrap supplies & full Nationwide removals and relocation services. We can provide all the packing materials and boxes required for any size house removal. Our aim is to provide a very simple, cost effective and high standard home or commercial removal, light haulage & delivery service. You can trust our teams of experienced, professional removals men to deliver. Removals: What you get with our service is a choice of one, two, three or four uniformed, experienced & friendly removal men to safely load (at your preferred time of day) your packed goods into one or two of our large, tail-lift fitted removals vans. All our men and vans are fully insured, our removals vans carry an ample supply of removals boxes, packing materials and carpet protectors as well as professional piano trolleys and ramps. Quality, removals to or from the Ipswich, Chelmsford, Braintree or the Clacton-on-sea area's of North Essex, South Suffolk and the East Anglia region UK. National and International Removals. Removals Ipswich and in the Ipswich area UK. Ipswich house removal service, Ipswich furniture delivery & boxes in Ipswich, Suffolk. Whatever your requirements, we are "BIG" enough. Without "Big prices". It's important for us to support the local economy and we are pleased to recommend these local services.